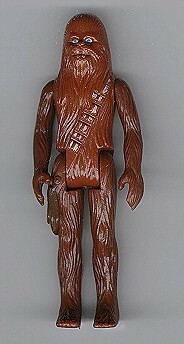 This is a pretty standard first shot figure; a fairly exact representation of the production Chewbacca figure,it is different only in the absence of dates and copyright markings from the back of its legs. What is of primary interest here is the time frame in which the piece was produced. Relatively few prototypes exist for the first 12 figures of the Kenner line, the Death Squad Commander being the one of the 12-Back figures I know of to boast several known first shot representatives. Chewie is an especially significant figure of which to own a prototype. Having originally been released in Kenner's early bird kit of early 1978, it is one of the first four figures issued. As you can see from the above photo, the figure lacks the date/copyright stamp. It has also not had its torso halves sonic-welded together, but is instead held together only by a small bit of glue applied to one area of the torso joint.